An in-depth dive into polyurea and other direct impingement thick film coatings. This class is designed for the applicator and contractor who are looking to expand their knowledge and understanding of polyurea. 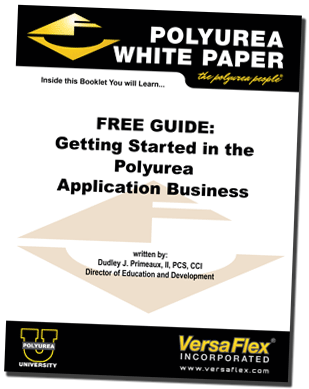 The class focuses on the details of installing polyurea including surface preparation execution and evaluation, priming, spray technique, equipment operation and maintenance, QA/QC testing, and trouble shooting. It includes hands on demonstrations of gun, transfer pump, and lateral hydraulic pump rebuild and maintenance. Attendees should currently be installing polyurea or other direct impingement thick film coatings. A basic introduction into the history, science, installation and uses of polyurea and other direct impingement thick film coatings. The class discusses the unique properties and characteristics of polyurea and the benefits of using polyurea as protective coatings. We highlight applications and industries where polyurea has been used successfully and why polyurea was the best choice for the project. Finally, there is an introduction to the technical application of polyurea and other direct impingement thick film coatings with an overview of surface preparation requirements and methods, basic equipment needs, operation, and maintenance, and QA/QC testing and monitoring. The class finishes with a live, hands on demonstration of polyurea application where all applicants are encouraged to spray.